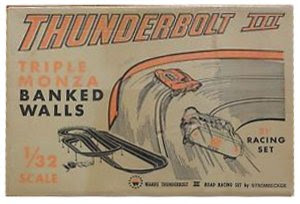 As Christmas approached when I was a kid and Rudolph the Red Nosed Reindeer aired on the TV, Dad would return from the garage with an enormous box emblazoned with "Thunderbolt III" and a picture of two race cars battling to victory. 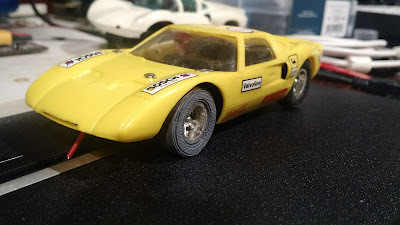 We set up the Strombecker slot car tracks and, grasping the blue speed controllers, we brought to life the epic struggle of white Chaparral 2D and yellow Ford GT 40 Mk II, father versus son. I still have that old slot car set. And now a child of my own. And though Dad left this life in 2010 and mom passed away in September, they'd be happy to see my 7 year old daughter and I reliving those moments from my own childhood. Except... when I finally unwrapped the cars, stored carefully 35 years ago, the tires fell apart in my hands. Rats. 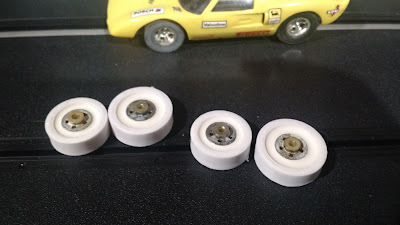 After some online research, I discovered one can create custom slot car tires using a 2-part RTV silicone rubber. So that's what I did. I found an Alumilite Super Casting Kit for $40 with coupon from the local craft store. The kit contains 2-part silicone rubber, 2-part resin, mold release, measuring cups, and stir sticks. The instructions describe using the silicone rubber to make the mold. Instead, I made a plastic mold with my Monoprice Architect 3D printer and used the rubber, instead of the 2-part resin, as the casting material. 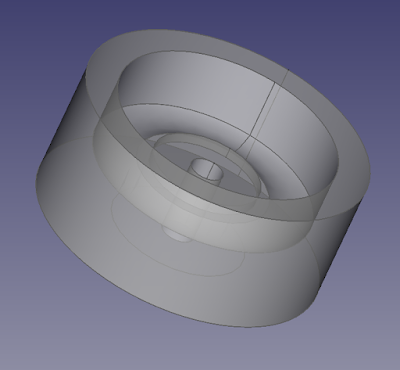 I designed the mold in FreeCAD. It is designed to mold the tires right around the original tires. The mold is basically just a bowl with a raised cylinder that the original tires snap onto. 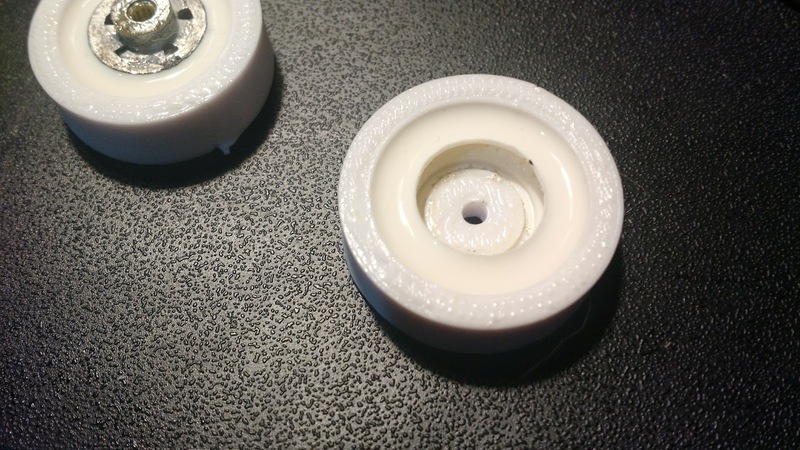 Then you pour the RTV Silicone goo around the outside of the wheels. In the first attempt, I thought it'd be fun to add black coloring. Since the silicone is white, the tire came out dark grey. I'll have to look for some clear silicone in the future. 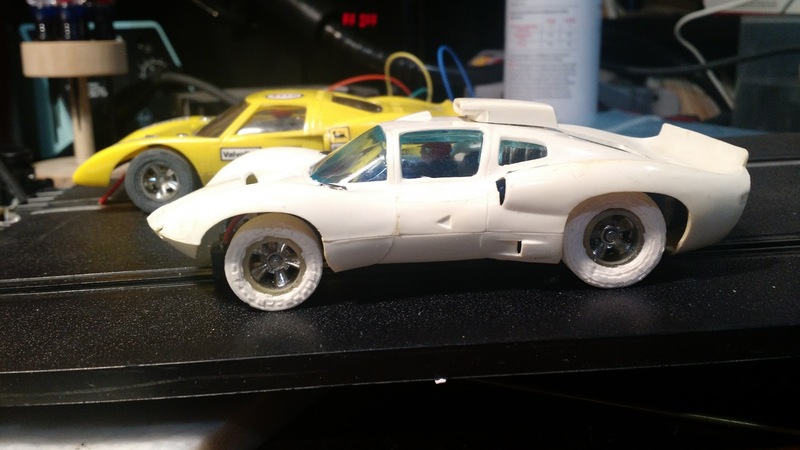 The first two test tires came out fine, and I put them on the GT40. I replaced the rear axle and tires with a set from eBay. I had a working slot car, although the silicone tires were slightly too large in diameter and inhibited contact of the pickup brushes with the track. For the Chaparral, I printed smaller front tire molds, and then printed the rear tire molds. I was able to get measurements from the crusty original tires before they fell apart. The next day I had a set of white tires for the Chaparral. 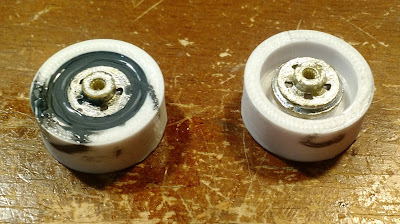 However, they have a tendency to come off the wheels really easily. But, they do have more traction than the original rubber. 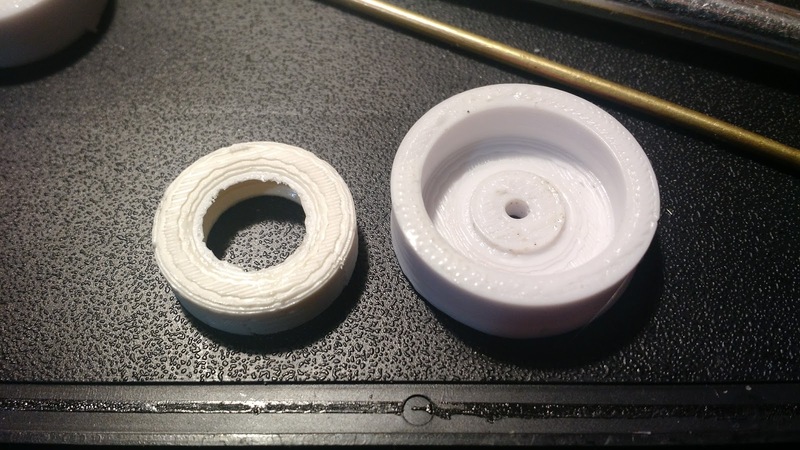 For the next attempt I'll 3D print a wheel and mold to create undersized tires that have to stretch a little to fit onto the original wheels. I ended up going a little nuts over the last month, buying two more cars (both need rear tires), a New Old Stock chassis, new brushes, and a ton of track. I repaired a lot of soldering issues on the cars and track.